Military clothing has long been adopted into civilian wardrobes. And military styling is all the rage with high fashion designers, advertisers, and clothing chains. Women of Color Resource Center (WCRC) created “Fashion Resistance to Militarism”, a provocative expos� of how militarism has seeped into our homes, our closets, and our minds. 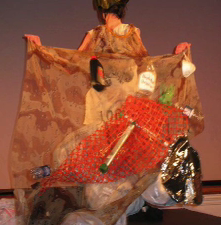 The first show was a one-night, standing room only event in Oakland on May 31, 2005, using fashion to explore a serious, intense, and sometimes very controversial topic in a creative way. 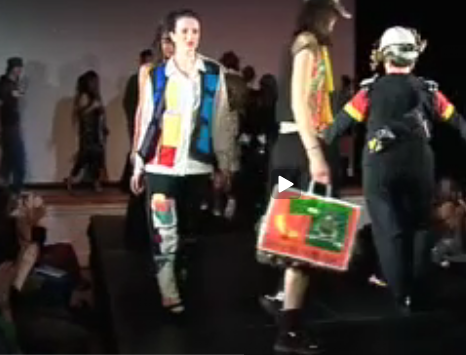 Models wore outfits created by local fashion designers, seamstresses, thrift store queens, as well as everyday street camo and demo wear. Writer and professor Cynthia Enloe explained the military origins of khaki. Spoken word artists and musicians added to the excitement—and the political analysis. Each design was paired with an informative script. Together the outfits told a wider story about militarism and “counter couture” for peace and justice, as described in Why War Is All the Rage. WCRC also produced a10-minute documentary that shows how militarized our society has become. The 2-cd “Runway Peace Project “ includes this documentary + how to create your own fashion show, available here. A set of postcards featuring 7 models and outfits are available here. 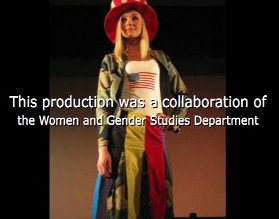 Each includes a caption that summarizes the script read by the narrator at the show. Since then, Fashion Resistance to Militarism has been produced in several cities across the country by various organizations, including in Atlanta, Claremont, Detroit, Eugene, Oakland, San Diego, San Francisco, Syracuse, Washington, DC, and the heavily militarized Pacific island of Guam. Each show is unique. 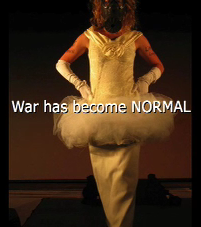 Some have focused on militarism and gender. Others feature outfits about federal tax dollars spent on militarism and war, or environmental contamination caused by war and military training. 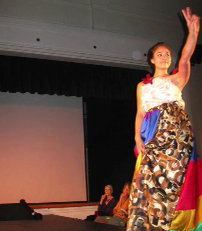 Many have included peace activists who take to the catwalk in demo wear. The WCRC show (2005) and the Eugene show (2010) were full blown theatrical events, with a “runway,” stage lights, slide show, and sound track. They included local fashion designers and artists, spoken word artists, musicians, and other performers. Other shows have offered a smaller taste – 5 or 6 outfits + scripts – as part of a workshop or conference. Women for Genuine Security is the institutional home for Fashion Resistance to Militarism. We encourage students and community groups to create your own show using sample scripts and designs archived here as a starting point. At a minimum you’ll need models, outfits, and a narrator to read the scripts. Beyond that, your imagination can take off! Send a link or photos of your show to info [at] genuinesecurity.org to be added to this growing archive. But much of the excitement of producing a show is in designing your own outfits that are relevant to your community and that tell the story you want to tell. This is a great way to involve local artists and designers, art students, yard-sale and thrift-store bargain hunters, and anyone who is handy with a needle, a stapler, or duct tape. Local peace groups may also want to co-sponsor and bring information to your event. For all the talk of change, militarism hasn't gone away under the Obama administration—far from it. The militarization of everyday life is in the air we breathe and the ideas we accept. 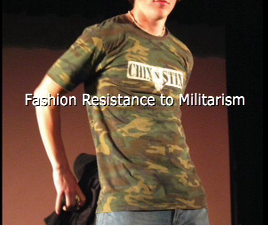 "Fashion Resistance to Militarism" is one popular way to break the militarized mentality that is more pervasive than any war , and to expose how militarism creeps into our national budgets, foreign policies, interpersonal relationships, and, yes, fashion.